With an abundance of puzzle-RPG titles on the App Store, it isn’t always easy to know which ones to play and which ones to let fall by the wayside. Let’s be honest, these aren’t always good, and narratives are often non-existent. As such, I was downright floored when Will O’Neill, the developer behind story-driven titles Actual Sunlight ($3.99) and Little Red Lie ($4.99), announced that his next title was a free-to-play mobile tile-match game called Guildmaster Story (Free). But I am so very happy that he has created this absolute gem of a puzzler. The game tells the story of Ganyo, a man who grew up with everything handed to him from his successful father who told him, and I quote, “never let other people tell you how to live your life." This unfortunately means that Ganyo is a lazy, greedy person. When his father dies, he inherits his casino and states that he wants to become a success by taking a decent amount of wealth and turning it into a pointless amount of wealth. Then Ganyo immediately burns the casino to the ground, and I was in tears of laughter. What happens at this point is what makes the game so special. First, he blames the firefighters, as the firehouses are all in the suburbs since the central locations were converted into firehouse-themed condos. Then, instead of trying to rise from the ashes, Ganyo tries to sell the literal ashes of his former casino. He doesn’t know how to work hard to rebuild, and he is so blinded by ignorance that he believes his giant pile of ash actually has value. Which it doesn’t, so he crashes and burns. This all happens quickly, and the game becomes about Ganyo trying to get his groove back while wearing his very rose-tinted glasses. Along the way he meets people who are, for whatever reason, willing to help him. He also learns how to manipulate some of these people to do his bidding. Guildmaster Story really isn’t your typical puzzle-RPG game. The narrative is entirely the reason for that. Each level contains a brief scene with Ganyo being Ganyo, advancing the narrative, followed by the actual puzzle. 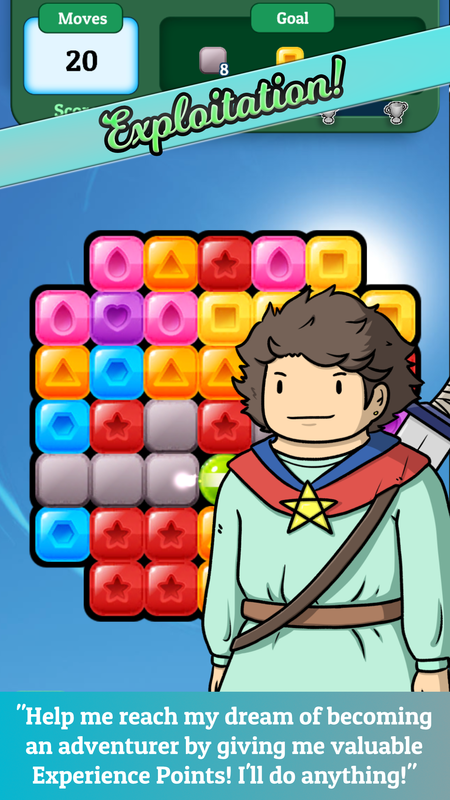 Each puzzle consists of multicolored square tiles, with a goal clearly displayed above. The goal is usually to destroy a certain number of certain tiles, to get bugs to the bottom of the screen, or to clear special tiles. The game is fully accessible to those that have color blindness. Each color of tile has its own unique, easily identifiable symbol. To clear tiles, click on any that are grouped together by color. Any number is good as long as it’s not a single tile, but be careful: each click takes a move, and there’s either limited moves or a limited amount of time. 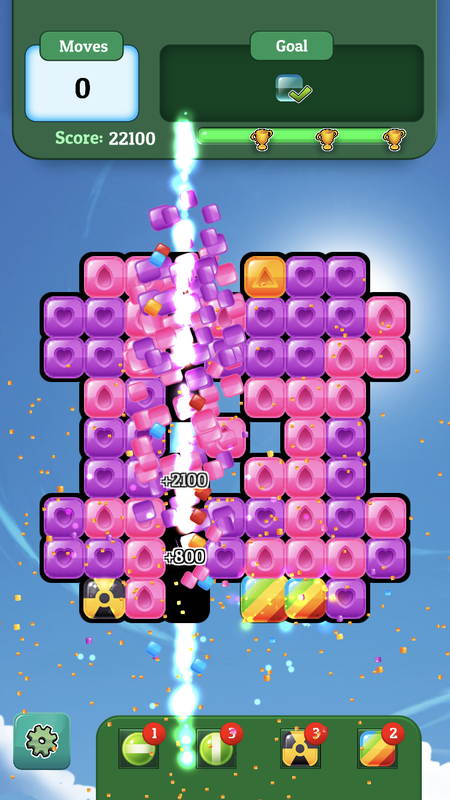 Your typical color-match puzzle boosters are all available in Guildmaster Story: the horizontal bomb, the vertical bomb, dynamite (like a square bomb), and a color bomb (destroys all blocks of a random color). These boosters appear naturally in the puzzle, or can be purchased in three-packs for 100 coins. Ah yes, coins. Let’s talk coins. This is a free-to-play title, after all, so in-app purchases are a must. There is a coins shop. I glanced at it… then spent like an hour watching ads via the level progression screen instead, which was a viable way to get through the entirety of levels currently available. The problem there is that I crave more, but I just need to be patient. What I crave isn’t so much the puzzles – I feel the need to know what happens to Ganyo, the man I love to hate (or hate to love). I want more laughs, like when a companion spoke so much of becoming a brand that I felt like Ganyo was suddenly in an episode of Lindsay Lohan’s Beach Club, where she never stops blabbing about the BRAND she’s trying to create in her name. While the game loves to take serious jabs at serious issues, it also makes fun of its very free-to-play puzzle-RPG genre. 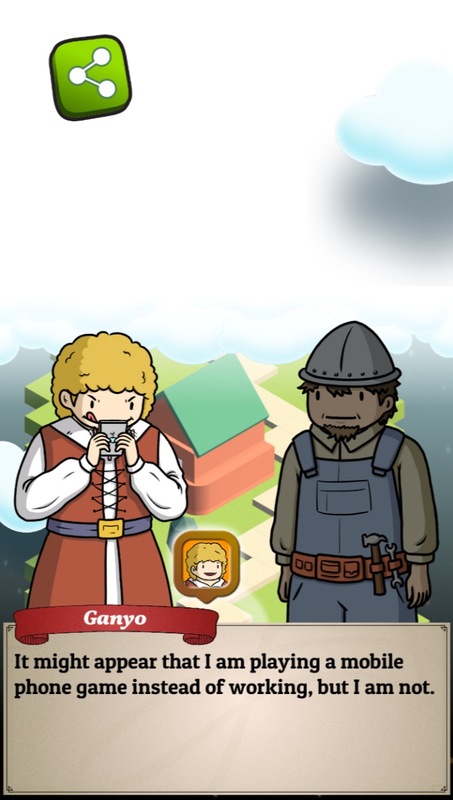 To rebuild, Ganyo pretends he is someone new in town, and recruits an RPG player to help him. In return, this friend would receive Experience Points, which are literally just words with no actual meaning. Thus, Ganyo becomes Guildmaster in the world he’s imagining in his mind, using real people at their very real expense to get what he wants without question. There are currently two “chapters," or 41 levels, available. And Ganyo has a measly two followers to order about with promises that will never happen. There is very obviously so much more to the story, and I find myself frustrated by that. Don’t get me wrong, Guildmaster Story doesn’t feel incomplete; I see it as being an episodic title in a way, and the first is downright gold. I just want more to the story. Ganyo quickly lists a half-dozen followers that we are yet to learn from, like the nerd that isn’t the “useful" kind or Rouge the Rogue who is here to kill people for money. What could Ganyo possibly have planned for them? 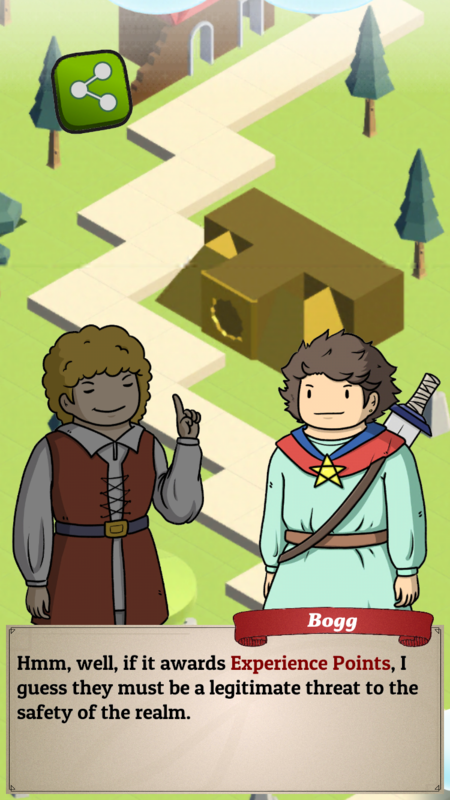 Guildmaster Story is, on the surface, a game about solving puzzles. The levels are fun, albeit entirely predictable and somewhat easy. But where the game truly shines is through its biting social/political commentary combined with the consistent jabs at the very free-to-play model the game is derived from. The irony is delicious and very much intentional. I look forward to Ganyo’s future business endeavours (and yours as well, Will O’Neill).